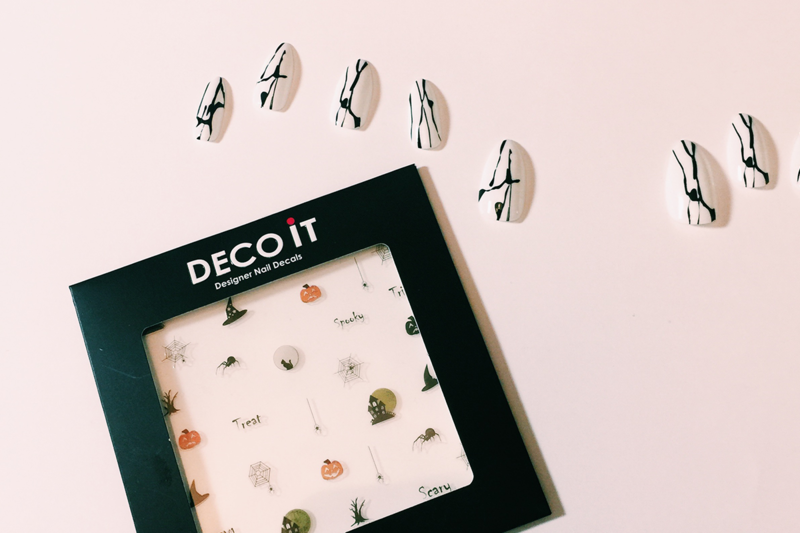 Deco IT have the best Halloween-themed stickers right now, and they’re perfect if you’re looking to jazz up your fingernails. I purchased a set of Primark stick-on nails for just £1- I thought these monochrome ones would be fab as they fit with the theme. I painted some of them different colours, most of which were colours from iZ, an awesome nail , and left others plain, before customising with my stickers. 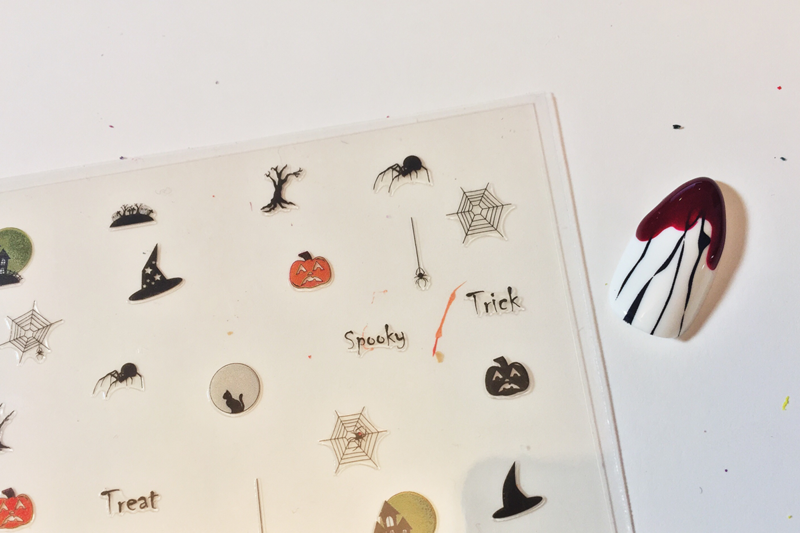 The stickers can be applied to normal polish, or gels which is fab- you simply peel them away from the plastic carefully with tweezers before sticking on the nail and pressing down. Add a top coat to maintain the look for longer. The second set of nails I decorated by purely painting them and omg guys forgive me this was my first time doing this- my GOD IT WAS MESSY. My first piece of advice would be, make sure you put something on top of the surface you’re working on- I put down some white, A3 card and it doubled up as a palette too- this way you can then throw it out and you won’t damage a paint palette you already have. 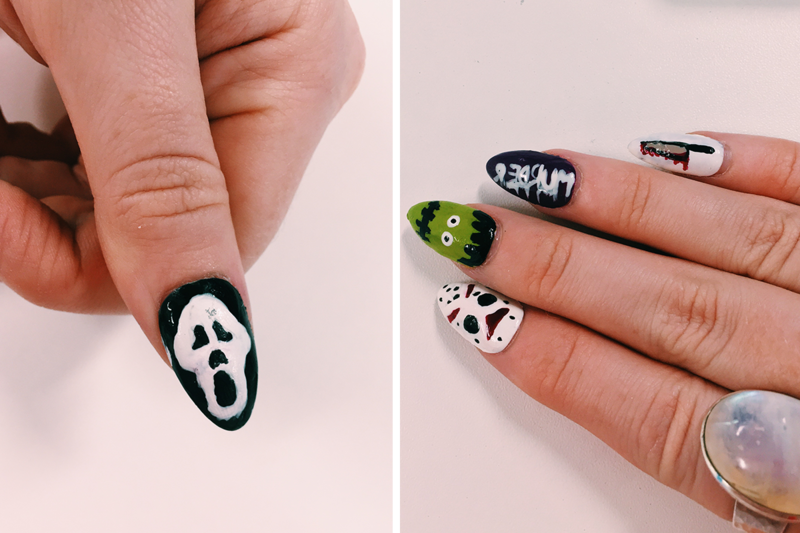 Again I purchased some nails from Primark (keeping it super cheap y’all) and decided to re-paint all of them with my favourite horror films as themes! I also picked up some super cheap and cheerful nail brushes from Poundland, and these were amazing for achieving tiny details on the nails. Okay so basically, trying to paint your nails initially is super hard if they aren’t actually stuck to your original nail. I quickly learnt this… hehe. The best thing to do is hold the nail down on the paper and paint the edges, swiping over the paper as you go. As this dries, it will then secure the nail to the paper, making sure you have something fairly sturdy to work with! Make sure you use good polish! I had a couple of cracked/years old polishes that I decided to use and quickly binned because they went very stringy and patchy very quickly. 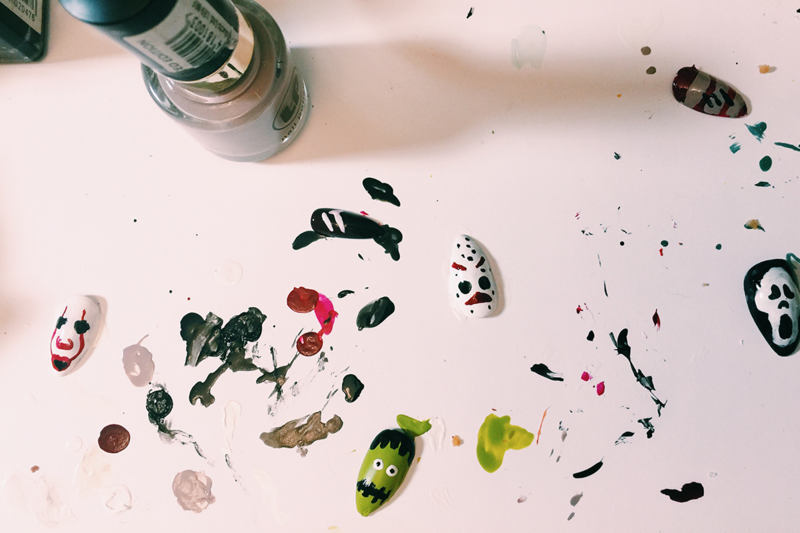 If you’re painting with a dark base, either leave negative space, or add white afterwards. For example when I painted the Scream mask, I applied a black base, before etching out the mask in full white, then detailing the eyes, nose and mouth on in black afterwards. Allow a generous time for your nails to dry- With a few of them, I got a little impatient and picked them up while they were still wet, which led to me dropping them face down and messing them up *cry face* ! Seal with a top coat- I can’t stress this enough! It’ll stop your design from chipping, and protect it from all manner of materials that could damage them. I would also be aware that applying the topcoat when the nails aren’t 100% dry is also a big boo boo! (I did this several times) so if in doubt, dip the nail into cold water quickly, allow to dry then add the topcoat. Do you have Halloween-themed nails this October? * Although I was gifted the Deco IT nail stickers, my views are of course as always, my own. Previous Post My Boyfriend Did My Halloween Make Up! 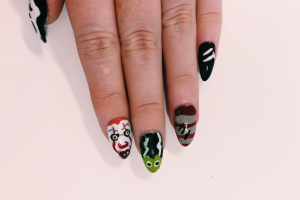 Now nails are kind of my thing and never thought about get into the spirit with Halloween with my nail. 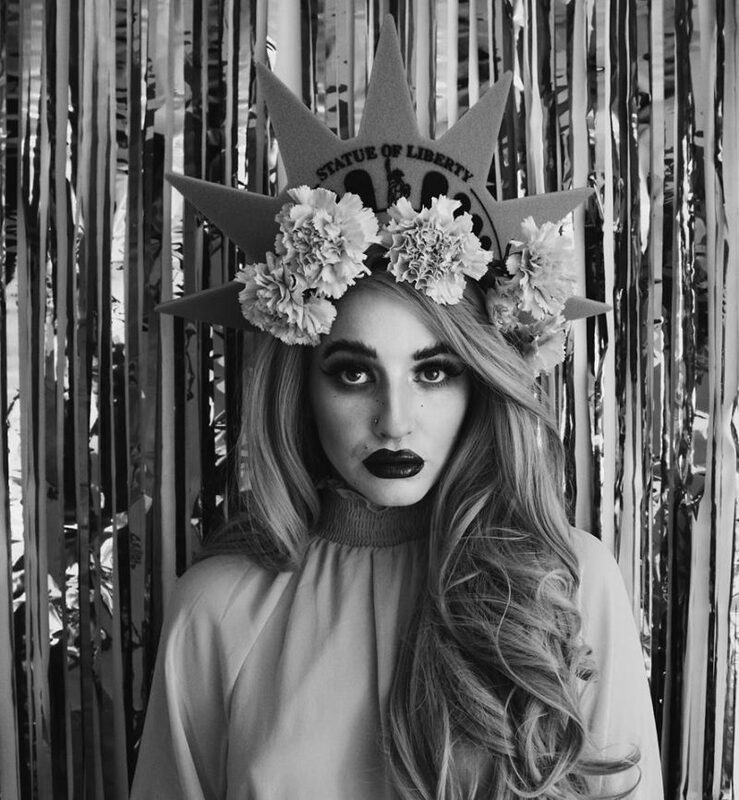 These are fab designs. 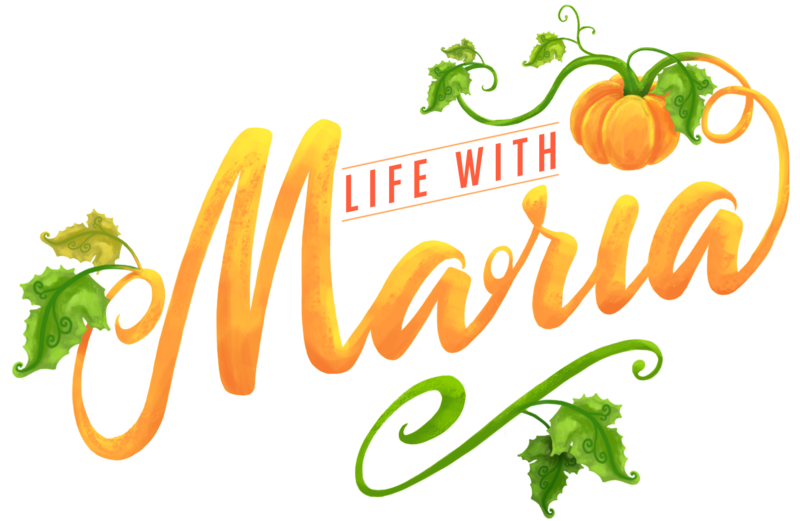 Thanks so much Kelly-Anne, had a lot of fun making these! You definitely should Chloe, it’s waaaay too fun! These are fun! 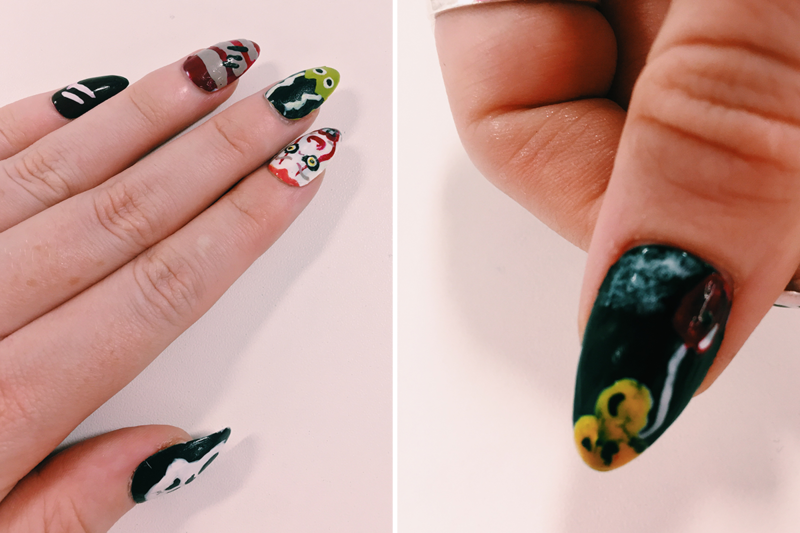 I am rocking a Halloween manicure thanks to my all-time favourite local nail lady. Honestly, I don’t know that I would bother paying anyone else but she never fails to surprise me. 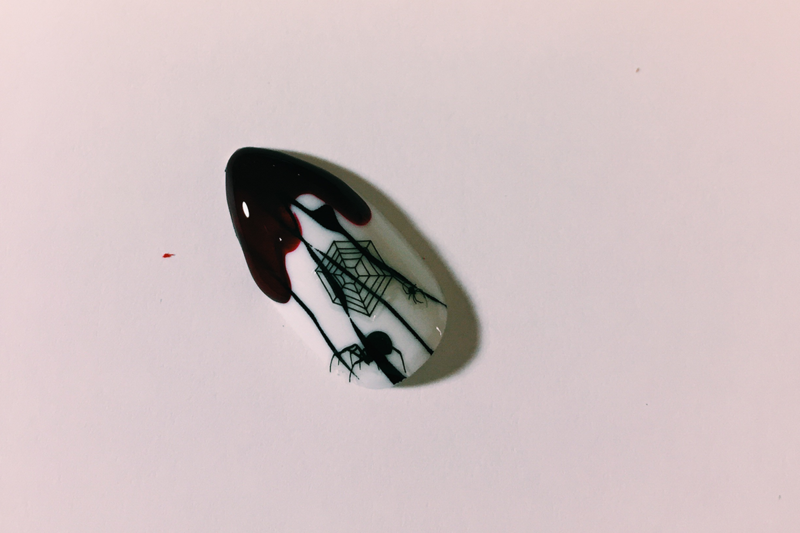 My current nails have a spider and a spider web, all hand painted, and they are so delicate and perfect! Omg Britt that’s amazing! I’ve been trying to find someone near me who does nail art but I’ve been so unsuccessful! The nearest I got to Halloween nails on gels are some purple ones I had done 6 days ago haha- I think they look boring!